These cards are made using bleach to stamp an image onto paper, and later stamping the same image over again, using coloured ink. Using different papers textures and colours creates different effects. I love the browns, but you can use any colour you choose. Dark colours work well because they have greater contrast. Test it out on a scrap of the paper you are going to use first. When you are using bleach to stamp with wear clothes that you don't mind getting ruined!!! If you spill, splash or inadvertantly wipe the bleach on your clothes, there will be bleached patches on them. Let the bleach to dry before stamping over the image with coloured ink. I wiped the bleach off the stamp after use with a baby wipe, followed by my usual stamp cleaner. 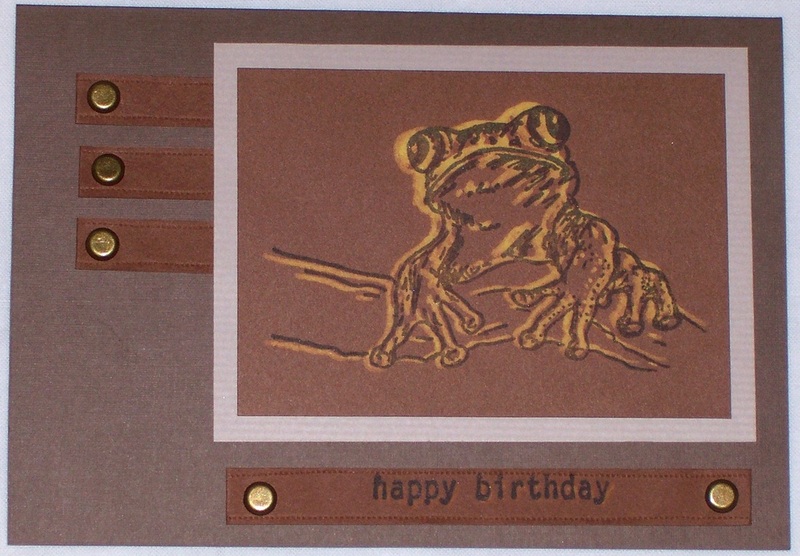 In the two Frog Cards above, I used "Tree Frog 2G8BA" produced by Fern Gully Stamps, Australia, and the Happy Birthday comes from the Stampin Up "Birthday Whimsy" set. In this card I stamped with bleach onto dark brown card - using a flower stamp from Autumn Leaves Clear stamps "flower stamps by rhonna farrer" selection. Once the bleach had dried I stamped the images over again with black ink. I cut out a rectangular section from this measuring approx 11cm x 9cmm and mounted it onto a piece of light brown card approx 12cm x10cm. I also punched two tags, one from the dark brown card, and one from the light brown card. 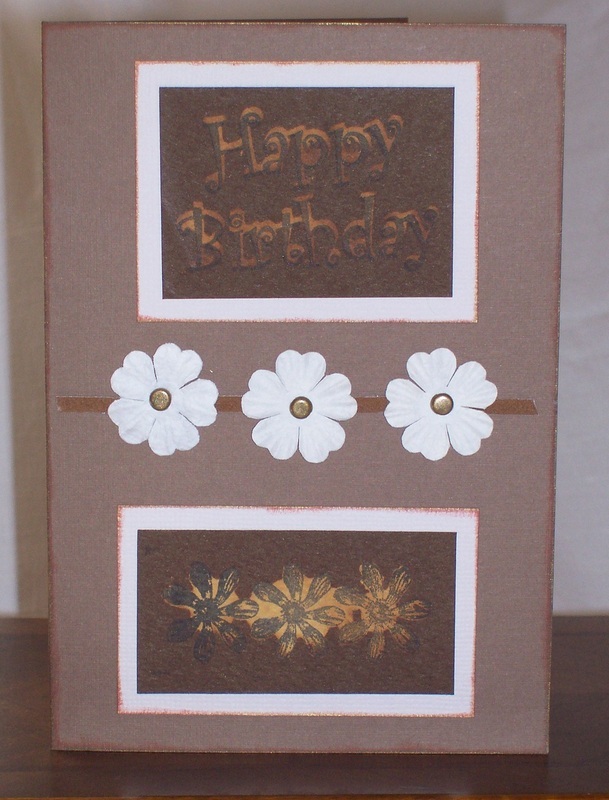 I have stamped "happy birthday" onto the dark brown tag, overlying the flower design (using the happy birthday stamp from the Stampin Up set, Birthday Whimsy). 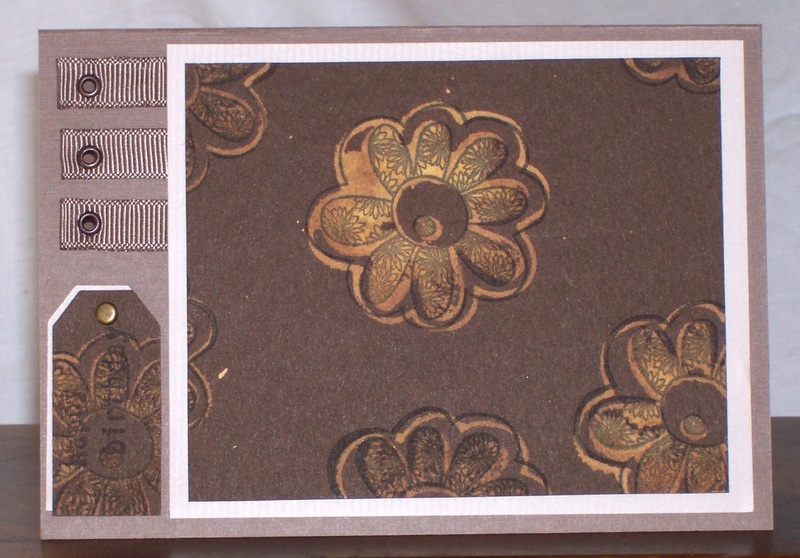 I used a medium brown card (21cm x 15cm, scored in half and folded) to make the card base. Onto this I have put three lengths of brown ribbon approx 8cm long each, each folded in half and secured with double sided tape and with a eyelet near the folded end. The two tags are layed on top of each other, and have a small brad (paper fastener) matching the eyelets as per photograph. The rectangular piece (made above) is attached as well, covering the unfolded end of the ribbons. In this card I again stamped with bleach onto dark brown card - using a flower stamp from Autumn Leaves Clear stamps "flower stamps by rhonna farrer" selection. On a different piece of the same colour card, I stamped the words "Happy Birthday" with bleach (the happy birthday stamp is form the Birthday Whimsy set by Stampin Up). Once the bleach had dried I stamped the images over again with black ink. 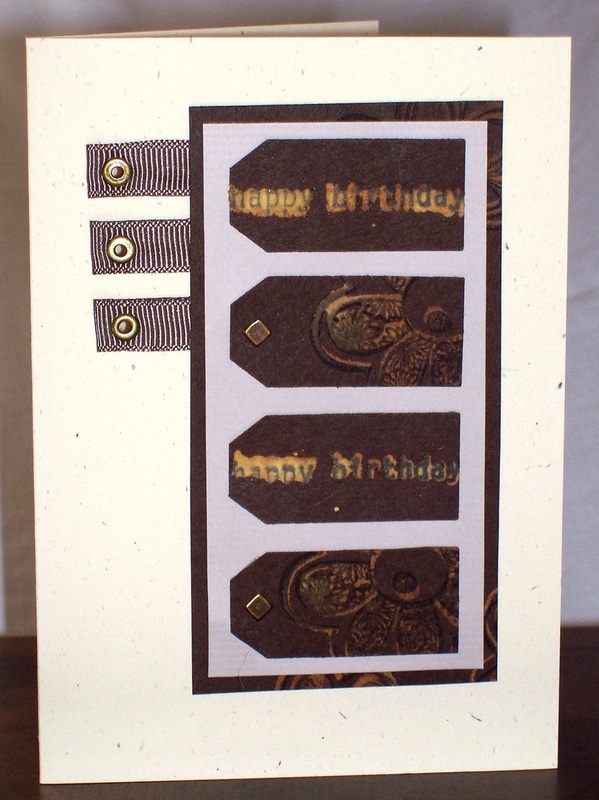 Using a Tag punch, I cut out two tags with flower design and two with Happy birthday on them. I positioned a square brad in the end of the two tags with flower designs. I then attached the tags onto a piece of light brown card (approx 5.5cm x 11cm). 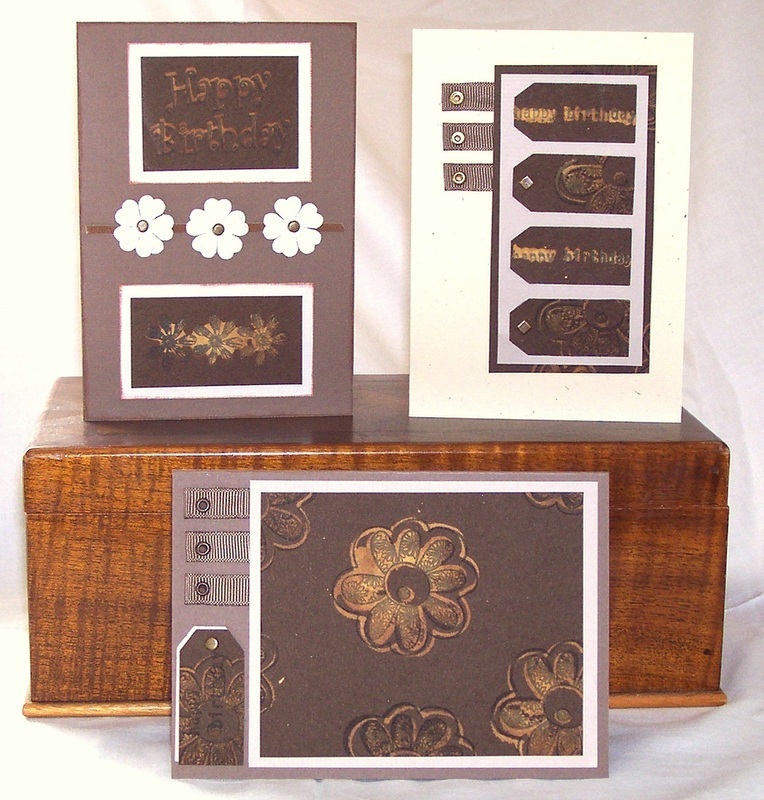 This I attached onto a piece of dark brown card (approx 12cm x 6.5xm) cut from the same card as the punched flower tags. I made a card base from cream card (21cm x 15cm piece of card, scored down the middle and folded in half). Taking three pieces of brown ribbon approx 6cm long, I folded them in half (held with double sided tape), and attached them to the card as shown. Three metal brads were used near the folded ends of the ribbon. The Tag section (made above) was then adhered to the card, covering the unfolded ends of the ribbon. See the photograph above for positioning. In this card I again stamped with bleach onto dark brown card - using a "Happy Birthday" stamp by Stamp-It "Happy Birthday" 1174D, and a stamp with three flowers in a row taken from a set called "Gardenia, bu Ruby Makenna 92610. These I cut out - The happy birthday to measure approx 6cm x 4cm and the flowers to measure approx 6.5 x 3.5 cm. I layered them onto pieces of cream card (approx 7cm x 5cm for the happy birthday and 7.5 x 4.5cm for the flowers). Before attaching them I sponged the edges of the cream card with brown ink. 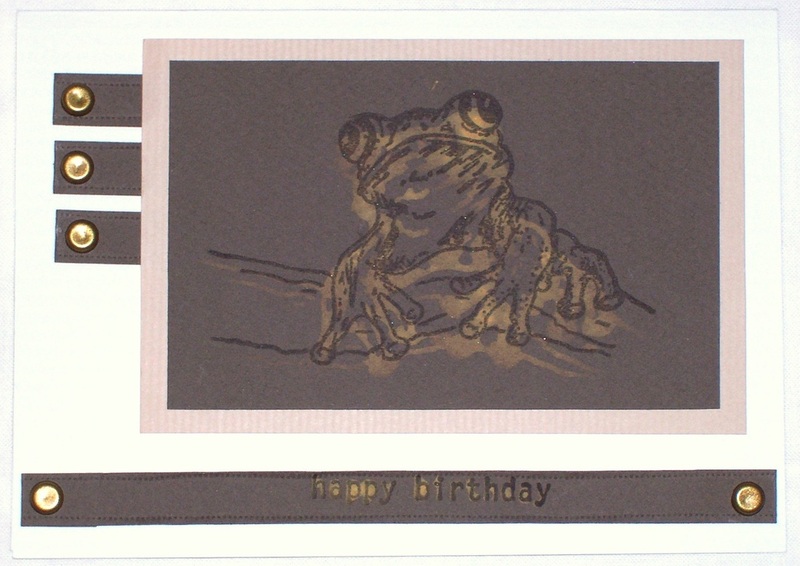 I positioned them onto a medium brown greeting card (21cm x 15cm scored, and folded in half) whose edges I had sponged with brown ink, as shown in the photo above. Across the middle of the card I attached a strip of brown leather approx 10cm long. Over the leather strip I positioned 3 cream paper flowers with metallic brads used as centres.